This collection consists of incoming and outgoing correspondence, news releases, addresses and remarks, logistical and planning materials, invitations and confirmations or declinations, copies of historic materials and other reference materials, and other such records related to the Kansas Civil War Centennial Commission, of which Alan W. Farley was member and chairman of this particular activity. The records specifically relate to the centennial celebrations held at Independence Hall in Philadelphia, Pennsylvania, re-enacting Kansas' entry into the United States and flag-raising as the 34th state in 1861. The documents are mostly arranged roughly in reverse chronological order and include correspondence with various militia units and patriotic organizations. Kansas was celebrating the centennial of statehood in 1961, also, so there is some communication with the Centennial Commission in this correspondence. 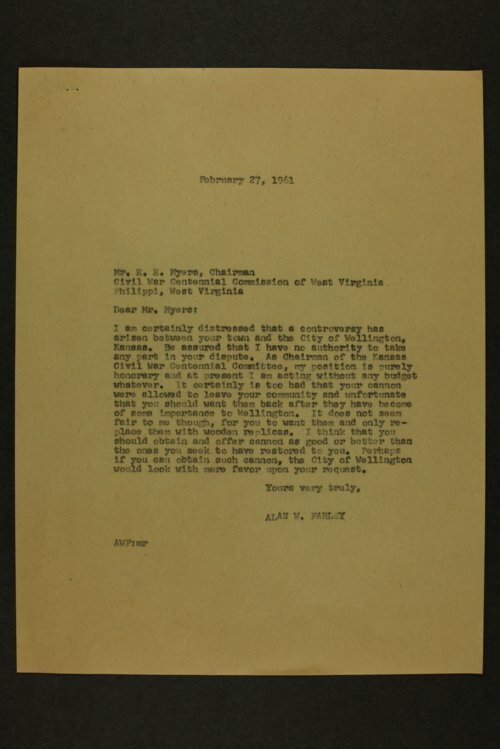 Collections - Manuscript - Farley, Alan W.
People - Notable Kansans - Farley, Alan W.